Perfect bars for SCS! No slits! Oversized 1 3/8 inch Outside Diameter. Height is 22 inches and Width is 25 inches. Solid 4130 Chromoly Steel welded for strength and durability yet very light! No Backsweep and No Upsweep. Raw steel finish - looks amazing! Raw steel finish - looks amazing! Oversized 1 3/8 inch Outside Diameter. Height is 22 inches and Width is 25 inches. 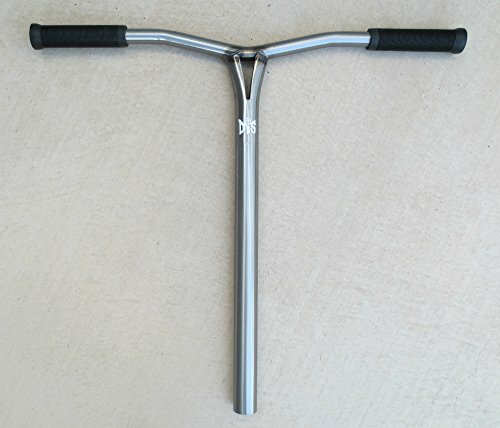 Wider bars for more control and better response. Solid 4130 Chromoly Steel welded for strength and durability yet very light! If you have any questions about this product by DropIn Scooters, contact us by completing and submitting the form below. If you are looking for a specif part number, please include it with your message.